Where's the best place to recruit nurse educators for a global leadership program? Prague. At least that turned out to be the best place to start the recruiting. The theme of the 24th International Nursing Research Congress in Prague July 22 to 26 was "Bridge the Gap Between Research and Practice Through Collaboration." The congress was organized and run by Sigma Theta Tau International (STTI), the Honor Society of Nursing. Amidst the picturesque backdrop of Prague, while trying to avoid over-indulging in goulash and braised pork knuckle, I joined several NFLA faculty to promote the program to nursing school deans and nurse educators. I tagged along with nearly 900 nurses to the Czech capitol for the five-day congress. The nurses hailed from more than 30 countries and came to network with colleagues, share best practices and hear about innovations in research and the practice of nursing globally. "Talking to this audience of international nurses, many of whom are junior educators or even potential mentors for the NFLA, is a rare opportunity," said Deb Cleeter, MSN, EdD and the consultant who helps run the NFLA. "We're expanding the pool of applicants this year and hoping to make the program truly global." I was most astounded at the congress to discover how many nurse educators, many of whom are in the latter stages of their careers and some already retired, travel regularly from the US to India, Haiti and other foreign lands to support nursing education programs. These globe-hopping educators reported on the many benefits of cultural and educational interaction between nurses of all countries (see the congress program). For me, it confirmed how much a program like the NFLA is needed, so that more and more nurse educators are encouraged to take global leadership roles, just as those traveling nurses have. The NFLA's 2012-13 cohort is the second for which the Elsevier Foundation has provided a $300,000 grant. The pilot program began in 2009 with a $200,000 Foundation grant and was called NFMLA (Nurse-Faculty Mentored Leadership Development Program). Since the start, it has been a rewarding partnership for STTI and the Elsevier Foundation, which together designed the academy to address one important aspect of the international crisis in nursing – the push to train more nurses has created a dire need for more and better prepared nurse faculty who remain in the profession. The Elsevier Foundation recently agreed to fund the program's next cohort for 2014-15. 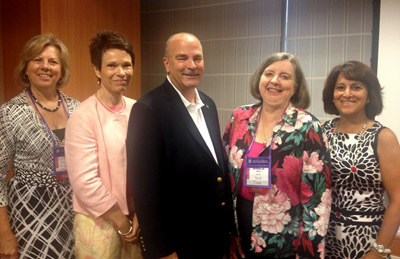 We were joined at the congress by several other NFLA'rs, including faculty expert Tony Forrester, PhD, RN, ANEF, Professor and Senior Associate Dean for Academic Affairs at the Rutgers College of Nursing; Barbara J. Patterson, RN, PhD, ANEF, Professor of Nursing and Director of the PhD Program at Widener University in Pennsylvania, another NFLA expert faculty member; and Bette Mariani, PhD, RN, Assistant Professor of Nursing at Villanova University College of Nursing in Pennsylvania and an NFLA graduate. Elsevier's own Ainslie Nibert, PhD, RN, FAAN, VP for Review and Testing/HESI, who is also an NFLA faculty advisor to the academy. The small NFLA group publicized the program to the congress attendees at an hour-long session that reviewed the outcomes thus far from the current cohort. The nurses in attendance asked a lot of questions about the program during and after the session. With the congress over and the application period formally open, we will be working with NFLA and STTI to publicize the program far and wide. For more information on the application process and to download the application, visit the NFLA area of the STTI website. I am very interested in this opportunity, and would love more information. Mary, I’ll email you directly and put you in touch with the NFLA folks who can help. In the meantime, please go to the Nurse Faculty Leadership Academy link above in the story and check out the website. Too bad this is limited to elite schools. There are a lot of excellent faculty in smaller schools who could benefit. Many of the national organizations that I respect and belong to, are making it harder and harder for those of us working twice as hard as elite school faculties because we don’t have the resources or the name recognition. Are we not as worthier because our schools are small or is it because we teach at schools with ADN programs? Just a thought. I was surprised at the quality and commitment to excellent nursing care and education at the school I current teach at. And that’s why as a new nursing faculty I accepted my position. Our faculty will never receive the respect, grants, and opportunties we deserve because once we are not one of the “nationally recognized” programs. Katherine, I assure you that the NFLA receives applications from and accepts nurse scholars (junior faculty) from nursing programs all over the country, and the world, from large institutions to very small ones. In fact, it currently has nurse scholars from small programs at Saint Francis University (Pennsylvania) and Los Angeles City College. I understand your frustration with having limited resources, but I encourage you to reach out and engage the NFLA leaders in a discussion about how the program works.